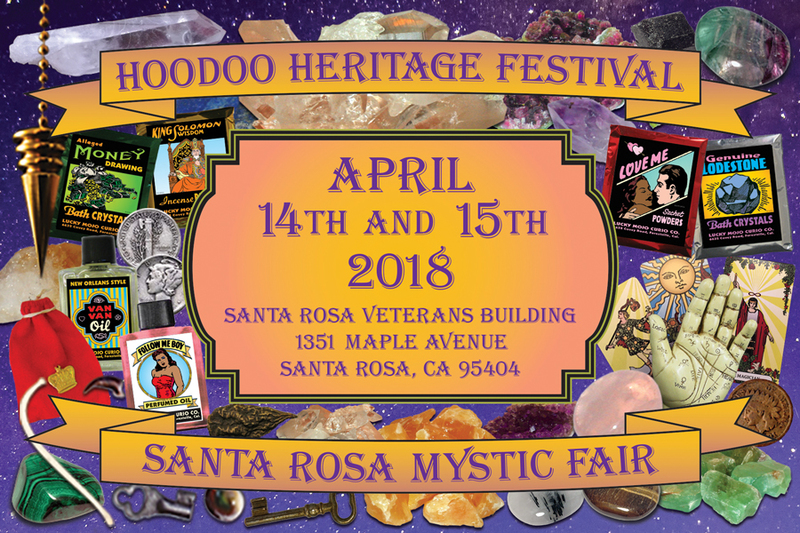 For the eleventh consecutive year, the Association of Independent Spiritual Churches is sponsoring our annual Hoodoo Heritage Festival in Santa Rosa, California. Join presenters Jon Saint Germain, Catherine Yronwode, Miss Phoenix, Deacon Millett, Mama E. and Clayton James, Angela Marie Horner, Devi Spring, Valentina Burton, Ms. Robin, and other special guests for classes, hands-on workshops, and panel discussions in African-American folk magic, rootwork, and hoodoo. These classes will teach you practical tricks and tips to take your conjure work to a new level of confidence and knowledge. In addition to spell-casting, we also showcase the mystery and magic of worldwide folk religions. Make your travel plans now to attend this unique 2-day Festival of Hoodoo Heritage, African-American folk magic, and spiritual spell-casting! Registration for classes begins during the month of January, 2018. Pre-payment is by Paypal. We encourage folks to sign up well ahead of the event - and offer price discounts for early registration. ALL TICKETS include FREE Admission to the Santa Rosa Mystic Fair, featuring more than 60 vendors of magical, spiritual, and metaphysical goods, plus access to the world's best psychic readers and rootworkers. Workshop Program Schedule: See below! Regular Ticket Prices until April 30th! Stay in touch with breaking news! SAVE $15.00 OVER DOOR-PRICE ADMISSION! Regular Weekend Pass Ticket Prices! SAVE $30.00 OVER DOOR-PRICE ADMISSION! 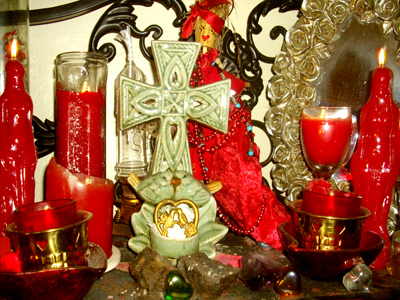 Take Hands-On Southern-Style Hoodoo Classes! Our festival opens with a workshop that sets the tone for charitable assistance to the victims of last October's wildfires. Papa Newt will lead a participatory presentation on the veneration and powers of saints in Catholic folk magic, both European-American and African-American, their patronage, and how to develop a working relationship. 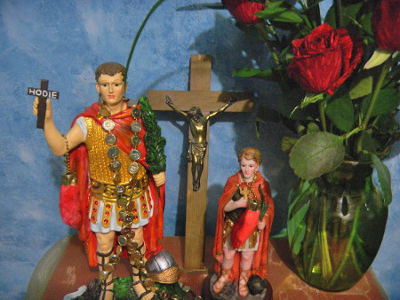 Along the way he will introduce us to a few of his favourites, including Saint Expedite, sometimes called the saint of the Internet. He'll also facilitate the creation of a community altar where we can approach Saint Joseph the Carpenter with appeals for help in rebuilding the homes and business buildings of our devastated town. The altar will be kept up throughout the festival and people can leave petitions and donations for contribution to the Redwood Credit Union's rebuilding fund. TAKE-HOME:A two-page flier on Patron Saints. A workshop on folkloric sorcery. You will learn how to use candles, oils, powders, nails, vinegar, and needles to cast spells to drive off rivals, break up lovers, and hot foot your adversaries out of town. Deacon Millett covers the gamut, providing instructions on how to break up illegitimate love affairs, cause former friends to hate one another, dissolve business partnerships, expel co-workers from the job site, and banish your foes to the ends of the earth. 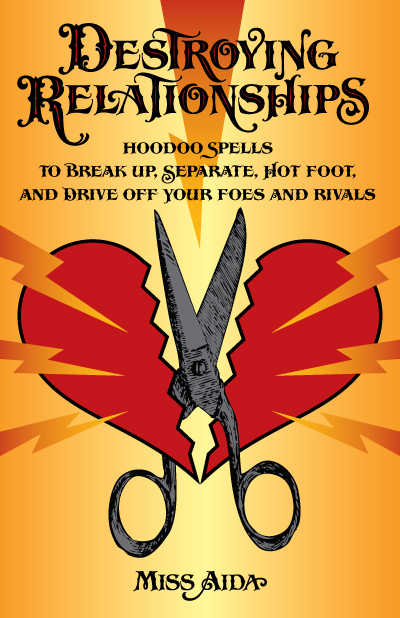 TAKE-HOME: A 96-page book "Destroying Relationships: Hoodoo Spells to Break Up, Separate, Hot Foot, and Drive Off Your Foes and Rivals," by Miss Aida. Teach you how to select your stones, train them for divination, and use them to read for yourself and others. Beginning with simple two and three stone castings, and working up to multiple-stone layouts. 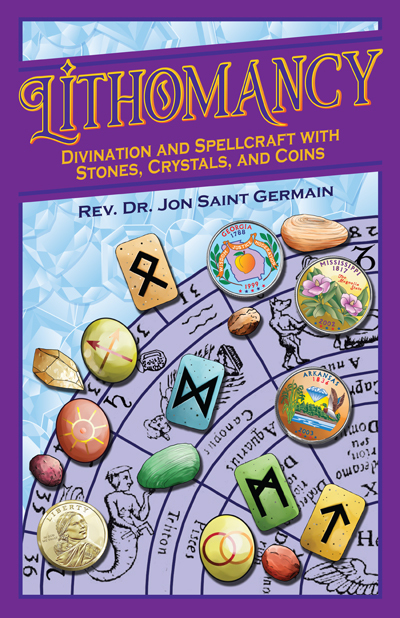 TAKE-HOME: Jon Saint Germain's brand new 96-page book, "Lithomancy". Those attending this workshop will learn old-school hoodoo methods for drawing luck and increasing cash flow in your home or business, as well as how to get that winning edge in gambling, lottery play, or at the casinos, and how to use authentic African-American candle lights, money mojos, floor washes, roots, herbs, and magical talismans to bring in and retain the wealth you want. 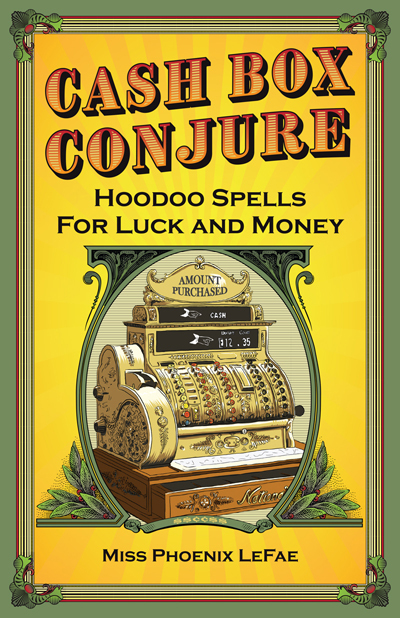 TAKE-HOME: Phoenix LeFae's brand new 96-page book, "Cash Box Conjure: Hoodoo Spells for Luck and Money". with one of our gifted on-site psychics. In this workshop you will find a treasure-trove of accurate, authentic, and easy-to-follow instructions that teach you how to craft and work with Conjure Hands, Trick Bags, Tobies, Gree-Grees, Jomos, Jacks, and Nation Sacks in the hoodoo folk magic tradition. 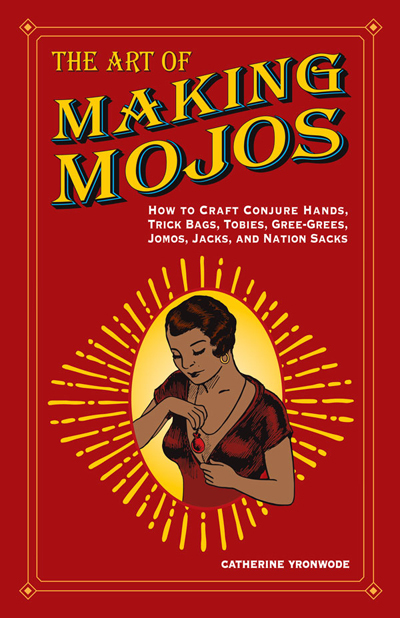 TAKE-HOME: Catherine Yronwode's brand new 96-page book, "The Art of Making Mojos: How to Craft Conjure Hands, Trick Bags, Tobies, Gree-Grees, Jomos, Jacks, and Nation Sacks." Devi Spring presents an overview of how hoodoo practitioners first encountered and honoured the gods and saints of Hindu and Buddhist traditions. She explains the popular and overlapping iconography, the protocols of the living religious traditions, rituals and tools of devotion, and how to integrate them into your rootwork. TAKE-HOME: A two-page flier on Asian deities! Combining Futhark runes, bind runes, and Solomonic seals with planetary and personal sigils and glyphs, Angela explains how to easily integrate them with traditional formulas and tools, adding them to rootwork and using them on spellcraft altars. Students will be guided to construct a specially-designed seal for their personal use. TAKE-HOME: A two-page flier on sigils and seals used in magic. Valentina Burton, the Fortune Teller of Dallas, will provide tricks and techniques to move beyond basic tarot divination so as to add value to your readings by integrating astrology, nativity, and numerology; and to enhance and improve your results by including tarot cards in your spellcraft. TAKE-HOME: A two-page flier on Tarot in Magic. Mama E. and Clayton James present an introduction and overview of candle use in folk magic and divination, cataloguing the common types of candles; explaining how to prepare and charge candles for spells, when and how to use figural candles, what placement and arrangement of candles are optimal for altar work, and how to construct moving candle spells. Workshop participants will prepare and dress a candle to take home and burn. TAKE-HOME: A two-page flier on candles and magic, sample candles. TAKE-HOME: A two-page flier on love and magic. READINGS BY AIRR MEMBERS AND OTHER PROFESSIONAL READERS DURING The HOODOO FESTIVAL! 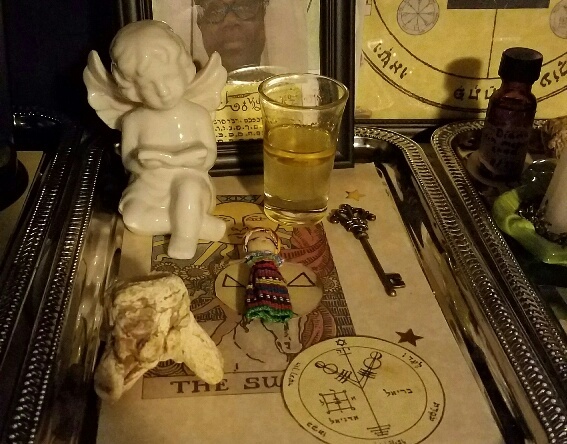 LEARN CONJURE AND FOLK MAGIC FROM NATIONALLY KNOWN HOODOO ROOTWORKERS! The following members of The Association of Independent Readers and Rootworkers (AIRR) and other professionals will be on-site during the Apprenticeship Week and Workshop Weekend and will be offering readings. Take advantage of some great discount prices for attendees only, and the opportunity to get an in-person reading with someone you might not otherwise have a chance to meet. All daytime readings are scheduled at 20 minutes each, to allow time for you and your reader to leave the workshops and return to them. After the workshops close for the evening, longer readings may be accommodated ~~ just ask your reader or our Reading Wrangler, Deacon Millett! Scheduling: You will be able to Schedule in advance. Availability: April 14 - 15 from 9:00 AM - 5:00 PM, except when attending workshops. Availability: April 14 - 15 from 9:00 AM - 6:00 PM, except when attending workshops. Availability: April 14 - 15 after 5:00 PM; one reading per evening only. 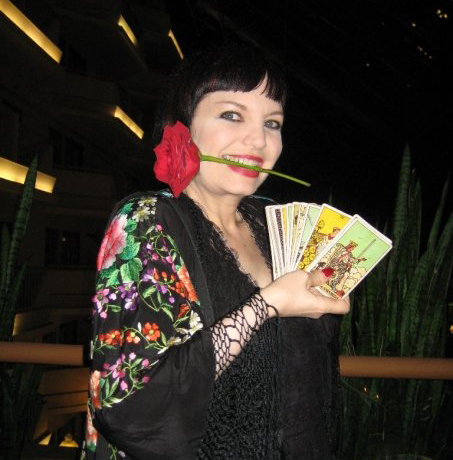 Valentina Burton: The Dallas Psychic, Palm, Tarot, and Astrology reader, spiritual counsellor and purveyor of hoodoo goods, Valentina will present a workshop on Tarot Card Magic. She will also be available for Tarot and palmistry readings. Deacon Millett: The pastor of Four Altars Gospel Sanctuary candle ministry in the Southern California High Desert, an AIRR Associate, a member of the Board of Bishops of Association of Independent Spiritual Churches, and the founder of the online Hoodoo Psychics reading service, Deacon Millett is best known for his love spells, reconciliation magic, and astrological compatibility readings. He will be teaching a workshop this year on Destroying Relationships and will also be our Reading Wrangler - see him first to schedule your personal readings. Mama E.: Mother of well-loved rootworker Dr. E. (1976-2014), Mama E. is a two-headed conjure doctor, clairvoyant and spiritual medium. Born in Cuba of Hispanic descent, her approach is based around both divination and practical solutions to get what you want. Mama E. is skilled at love and reconciliation work, justice work, removing curses, uncrossing her clients, and restoring their blessings after being attacked. She is a priestess of Oshun in the Lukumi faith who underwent Kariocha (initiation) on January 19th, 2002 and was scratched in Palo Kimbisa on November 17th, 2001. Mama E. will be presenting a workshop on Candle Magic with Clayton James at this year's festival. Angela Marie Horner: Angela Marie Horner discovered her gift for magic and dreaming true while still a teen. She is a member of AIRR, has worked at the Lucky Mojo Curio Company, and at Missionary Independent Spiritual Church, where she has given readings, and served as a Candle Deacon setting lights for clients from around the world. A graduate of the National Holistic Institute of Massage in Petaluma, she is also a Certified Massage Therapist and health educator, and a First aid / CPR instructor with the American Red Cross, and has a long history of caregiving, both elder care and diabetic care. She will be presenting a workshop on Sigil Magic. Devi Spring: A member of the Association of Independent Readers and Rootworkers (AIRR), Devi is also a moderator on the Lucky Mojo Forum. She grew up in Florida, with a maternal family line that spans back into at least the mid-1800s in New Orleans, and biological cultural ties to Mexico through her father. She has a Religious Studies B.A. from the University of Toronto and was trained in the Western ceremonial magick tradition through Temple of Isis Urania. She was initiated in the Sri Chaitanya Saraswat Math lineage of Gaudiya Vaisnava Hinduism and has taken lay Buddhist vows at Tengye Ling Tibetan Buddhist Temple. Devi will be presenting the workshop this year on Working with Asian Deities. Miss Phoenix LeFae: An intuitive Tarot reader, freelance writer, spiritual consultant, rootworker, ritualist, and teacher of Goddess Spirituality. 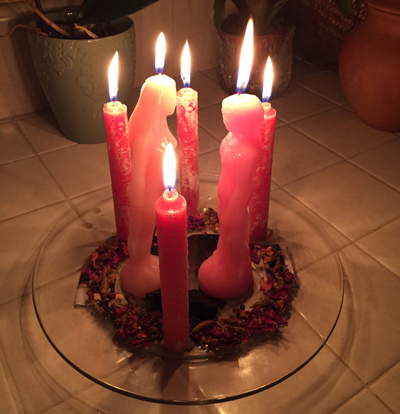 Miss Phoenix is a candle server at Missionary Independent Spiritual Church and a member of Hoodoo Psychics, where she is well-known for clearing crossed conditions and healing work, as well as for providing magical coaching to those who desire one-on-one training in spellcraft. She will be teaching a workshop on Cash Box Conjure. She will also be available for Tarot readings. Clayton James: As the surviving spouse of rootworker Dr. E. (1976-2014), Clayton, alongside Mama E., has used his Entrepreneurial skills to keep the legacy of Dr. E. alive through their candle ministry and rootwork products and services. Clayton James learned alongside Dr. E. and benefited from his knowledge and many years of experience across countless traditions, practices, and spiritual circles. Using his own words, "My singular mission in this community has been to keep the voice and legacy of Dr. E. alive, as well as to maintain his works and mission of education and authenticity." Clayton's biggest role in Dr. E. Products has been one of tech and accounting but also has helped to secure new herbal suppliers. In 2017, Clayton founded the spiritual candle company Transcendent Candles after tireless bad experiences with a national candle company. "Spiritual industries are still industries and small shop owners and their customers deserve the respect of consistent, quality candle inventory," he says. Transcendent Candles currently specializes in an ever-expanding line of figure candles with 12 models in production and vigil lights in the works. Clayton will be presenting a workshop on Candle Magic with Mama E. at this year's festival. Jon Saint Germain: With over thirty-five years of experience helping people resolve relationship, life, love, career and other issues, Jon Saint Germain is an ordained minister, intuitive consultant and rootworker. His greatest pleasure in life is helping people attain the happiness they deserve. 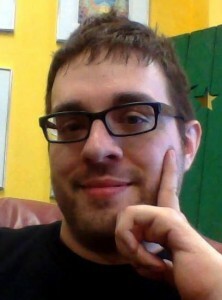 A member of AIRR and Hoodoo Psychics, he will be instructing a workshop on Lithomancy: Divination and Spellcraft with Stones, Crystals, and Coins and offering private lithomancy, numismatomancy, and palm-reading appointments during the weekend. Papa Newt: Raised within the Catholic tradition and a long time student of magical traditions and sorcery, Papa Newt is verse in working Christian magic and other magical styles to help others conjure possibilities. Papa Newt will be presenting a workshop on Patron Saints at this year's festival. Ms. Robin: Ms. Robin is the Bay Area's premier spiritual sister, a gifted reader, root worker, and radio personality. She, along with miss catherine yronwode, founded the Annual MISC Hoodoo Rootwork Workshops. 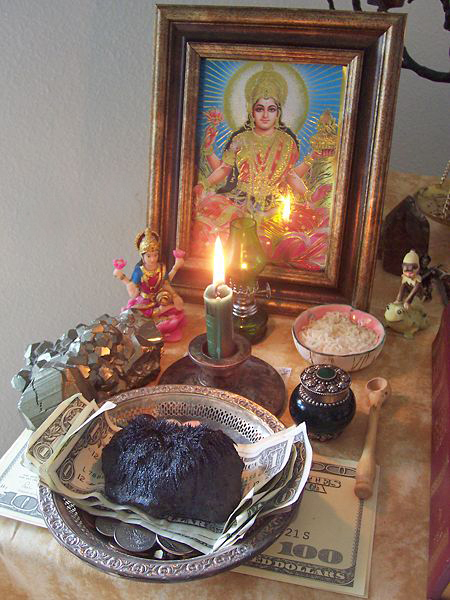 She is best known for her money spells, gambling spells, love spells, curse spells and doll baby spells. She will be teaching a workshop this year on love spells. Miss cat yronwode: The co-owner of the Lucky Mojo Curio Co. in Forestville, California, an AIRR Associate, she is a member of Hoodoo Psychics, and Pastor of Missionary Independent Spiritual Church. catherine will debut her new book "The Art of Making Mojos: How to Craft Conjure Hands, Trick Bags, Tobies, Gree-Grees, Jomos, Jacks, and Nation Sacks." She will also be available for Tarot and palmistry readings. Are you a church member or a visitor who wants to support the Association of Independent Spiritual Churches? If so, please click on the Paypal Secure Server logo to make a small donation to the AISC for the creation and maintenance of this site!